Noted filmmaker delivers talk on race and performance, and talks with students about the film industry. At the Brooklyn College Student Center, movie director Spike Lee takes questions from students after his keynote address at the "Race and Performance" conference organized by the Africana Studies Department. 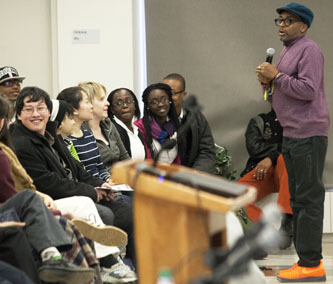 More than 300 Brooklyn College students filled the Student Center on Feb. 25 to hear noted filmmaker Spike Lee deliver the keynote address for "Conversations on Race and Performance," a discussion on the legacy of minstrel in modern-day television and film. The event was part of a Black History Month program, now in its second year, sponsored by the Department of Africana Studies. As part of the program, Lee met earlier that day with close to 80 students in Introduction to Production (FILM 1201), taught by Mustapha Khan, an Emmy Award–winning visiting professor in the Department of Film. During both talks, Lee took questions from students and shared with them his personal experiences in crafting his career as a filmmaker. "Students who attended both events enjoyed how direct and to-the-point Spike Lee was," said Khan. "I think he became genuinely interested in the experiences of our students and relished taking questions beyond the time allotted to us." "Listening to one of the most famous directors in the world talking about his experiences can only help our education," said junior Jennifer McQuaile, an Irish native who traveled to the United States to study film at Brooklyn College. "He also reminded us that it is our films, scripts and our work in general that will get us jobs. Talks like his help us stay on the right path to pursue our dreams." Originally from Atlanta, Lee and his parents, schoolteacher Jacqueline Shelton and jazz musician and composer Bill Lee, moved to Brooklyn when he was still a child. After graduating from high school, Shelton Jackson "Spike" Lee returned to Georgia to attend Morehouse College, an all-male, historically black institution of higher learning established in Georgia in 1867. "I did not find film. Film found me," said Lee during his keynote address. "The beauty of a liberal arts education is that you get exposed to many influences, and you can learn something different from each discipline until you find what you love, and then you can do it for the rest of your life." Lee, who has directed, produced, written and acted in dozens of films over the past 30 years, is also a film professor at New York University's Tisch School of the Arts, where he received his master of fine arts degree in film production. He founded 40 Acres and a Mule Filmworks, based in the Fort Greene section of Brooklyn, in 1986. 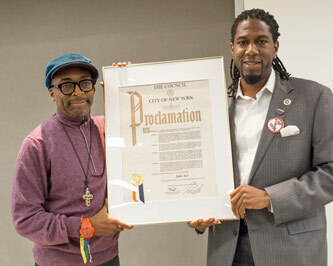 Famed filmmaker Spike Lee receives a New York City proclamation from Councilman Jumaane Williams '95. "The quest for knowledge never stops," Lee said toward the end of his talk, before accepting a New York City proclamation presented to him by Councilman Jumaane Williams '05 M.A. "When you find, not what makes you money but what you love, you can spend the rest of your life learning." Other panelists for "Conversations on Race and Performance" included Africana Studies Professor George Cunningham, Assistant Professor of Cinema and Media Studies Racquel Gates of the College of Staten Island, Film Department Chair Paula Massood, English Professor Michele Wallace of The City College of New York, and Professor Ray Allen, senior research associate at Brooklyn College's H. Wiley Hitchcock Institute for Studies in American Music. Next fall, the Brooklyn College Barry R. Feirstein Graduate School of Cinema will enroll its first cohort of students. The product of a partnership between Brooklyn College and Steiner Studios, the school will be the only one in the country seamlessly integrated into a working film lot.